Believe it or not, this is a kid friendly recipe. But on the other side of the world, my future significant other was making roasted peppers with his grandmother. Every summer, he would travel to Israel for the summer to spend time with his family. During these visits, he was most excited to make these peppers. His grandmother would do the pepper-charring. Then him and his cousins would peel the charred skin off the peppers and throw them in jars with lots of olive oil and garlic. The longer they sit, the more olive oil and garlic they soak up. As a child, it was his candy. As an adult, I’d have to agree. 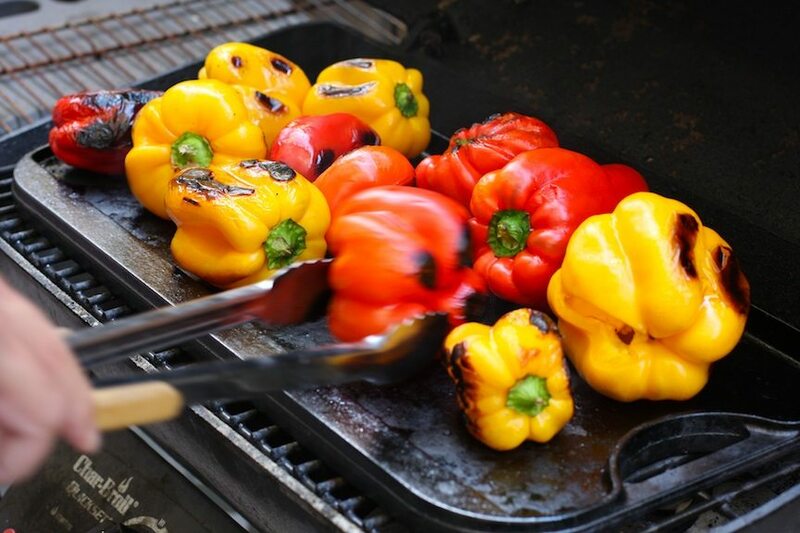 The peppers sweeten as they char, then get mega-infused with loads of garlic and olive oil. 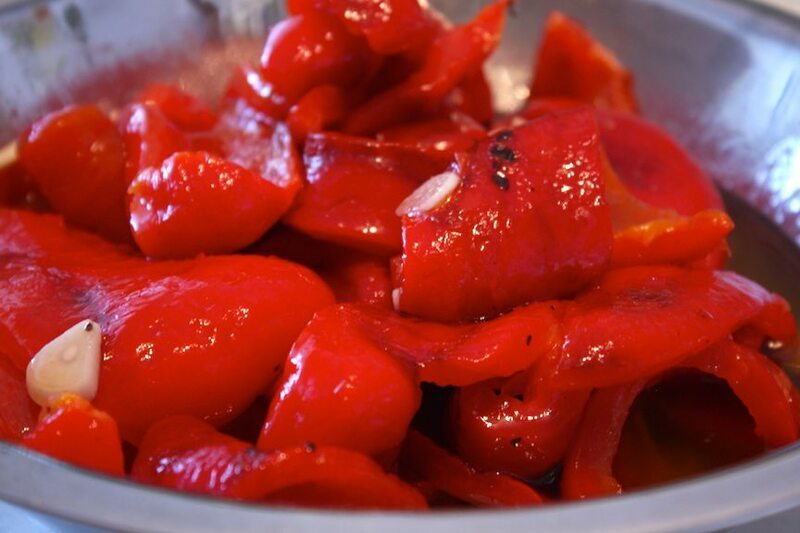 Now that I’m older and wiser, I’ll trade rice crispy treats for these peppers any day. 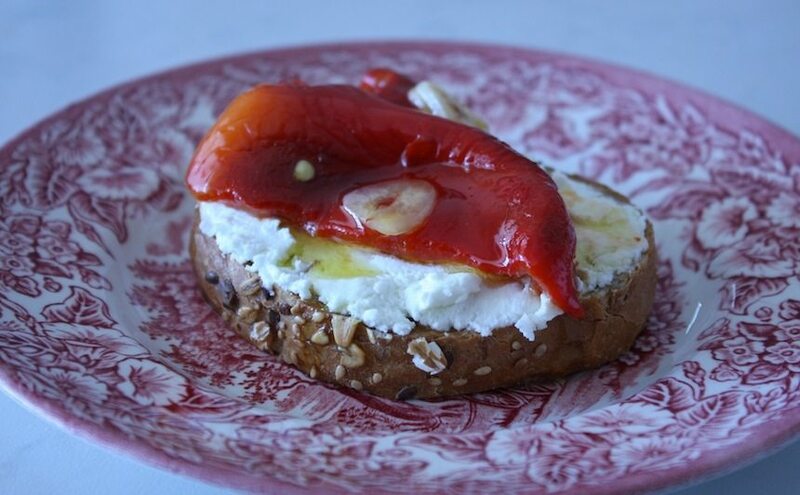 Marinated roasted red peppers are now a summer staple in our house. The moment red bell peppers show up at the market, they are brought home by the bag full. These days, our fridge is constantly packed with jars of these peppers and marinated eggplant (also a recipe from the significant other). This allows us to throw great dishes together at a moment’s notice. Antipasto, a quick sandwich, pasta, anything really. Personally, I love slicing it up and adding it to potato hash for breakfast or plopped on top of grainy toast schmeared with goat cheese. If and when we decide to spawn our own little buggers, they will definitely learn to make these peppers as soon as they can say, “garlic”. Place them under the broiler in your oven, turning them as needed. With tongs, char them over an open gas flame (although this can get a little messy). You can put them on an outdoor (or indoor grill). Use a heavy bottom skillet, such as cast iron. Electric skillets work well too. Although since they don’t get as hot, they take a little longer. The main thing to remember is that you want to get them black on all sides. (If you don’t blacken them enough, attempting to pull the skin off will make your head hurt.) Once blackened, place them in an empty pot that has a lid. If you don’t have an extra pot with a lid, use a paper bag placed inside of a plastic bag to catch the juice. Keep the lid on the pot as the peppers finish. The hot peppers will begin to steam further loosening the skin from the flesh. Leave them to sit for about 15 minutes. They should then be cool enough to handle. Peel off the skin of the peppers and discard. Tear, or cut, the peppers into large strips (or whatever size you’d like, I’m not here to judge). Set aside. In a large bowl, combine garlic, vinegar, olive oil, salt and pepper. Whisk to combine. Add the peppers and gently toss to coat the peppers. 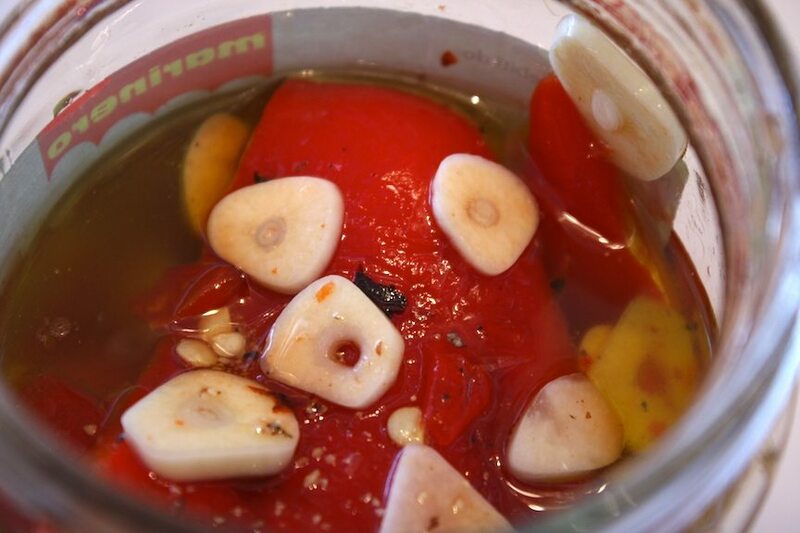 Store the peppers in an airtight container, preferably a glass jar, and place in the fridge. Let them sit overnight before eating. They keep for about a week. And you absolutely should reuse the olive oil marinade for dressing or drizzling it on meat, veggies, just about anything. I love your recipes and you make me laugh with your spontaneous funny comments, I will make this today, bell peppers are on sale 2 for 99 cents yeah! !